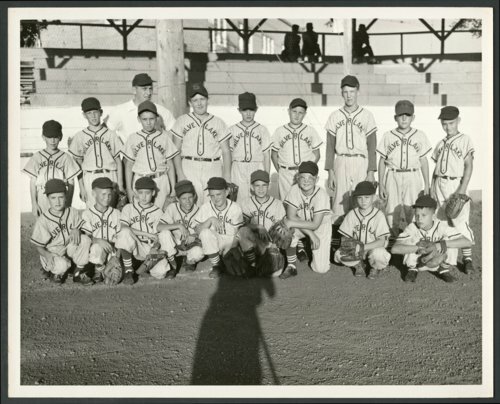 This photograph from the late 1950s shows a Little League team from Silver Lake, Kansas. The team's manager, Homer Mongold, is in the back. Players standing in front of him are (l to r): Merwin Kirkwood; Terry Blush; Sidney Mongold; Floyd Combs; Jack Steele; Darrel Bahner; Arlen Kirkwood; Alan Landis; and Kenny Harden. Kneeling in the front row are (l to r): unknown; Bob Pardee; Bobby Whitehead; Ronnie Trimble; unknown; Bernard Robinson; Danny Mitchell; Homer VanVleck; and Mike Mitchell. Digital reproduction of the photo was accomplished through a joint project sponsored by the Kansas Historical Society and the Shawnee County Baseball Hall of Fame.